The father of Frank Scott (the pickle proprietor of previous posts) was Horace L. Scott, my great-great-great grandfather. Horace was born in New York, around 1842, and died in Illinois, around 1870-1875. If it weren’t for the Civil War, I would know almost nothing about Horace. His headstone is a military-provided headstone, and nearly all the records I’ve been able to find that reference him are military records. Horace L. Scott worked the land as a farmer and as a farm laborer. At some point before he was 20 years old, Horace relocated to Alden, McHenry County, Illinois. In August, 1862, Horace enlisted to serve as a Union soldier in the American Civil War. According to his entry in the Illinois Civil War Detail Report of the Illinois State Archives, Horace enlisted in the army on August 6th, 1862, in Harvard, Illinois. He was enlisted by L. Blanden and he signed up for a term of 3 years of service. Horace mustered in on September 4, 1862, in Rockford, Illinois, and became a Private in Company C of the 95th Regiment of the Illinois Volunteer Infantry. According to this same source, Horace was 22 years old when he enlisted, was 5′ 9 ½” tall, had brown hair, black eyes, and a dark complexion. He was born in New York, was single at the time of enlistment, and was occupied as a farmer. 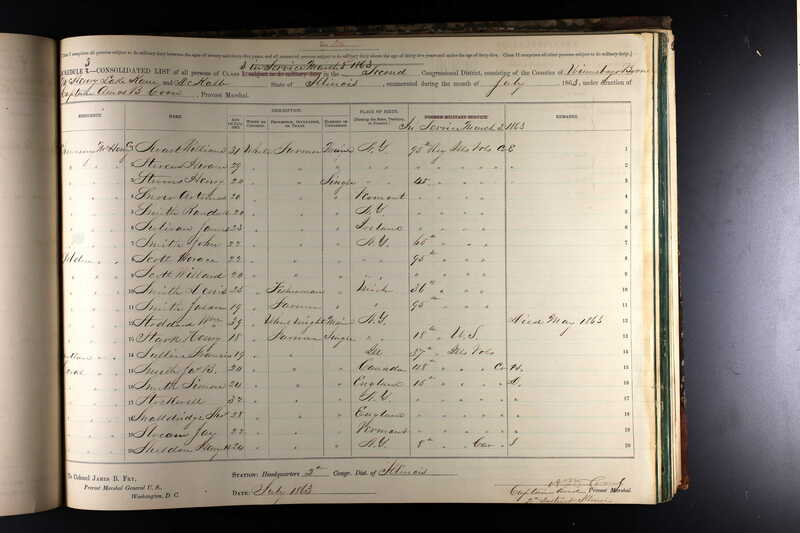 According to the National Archives and Records Administration (NARA)’s Civil War Draft Registration Records, a 22-year-old Horace Scott, residing in Alden but born in New York, was listed as being in active military service as of March 3, 1863. He was a member of the 95th Regiment of the Illinois Volunteer Infantry. Horace remained in the military until after the end of the Civil War. 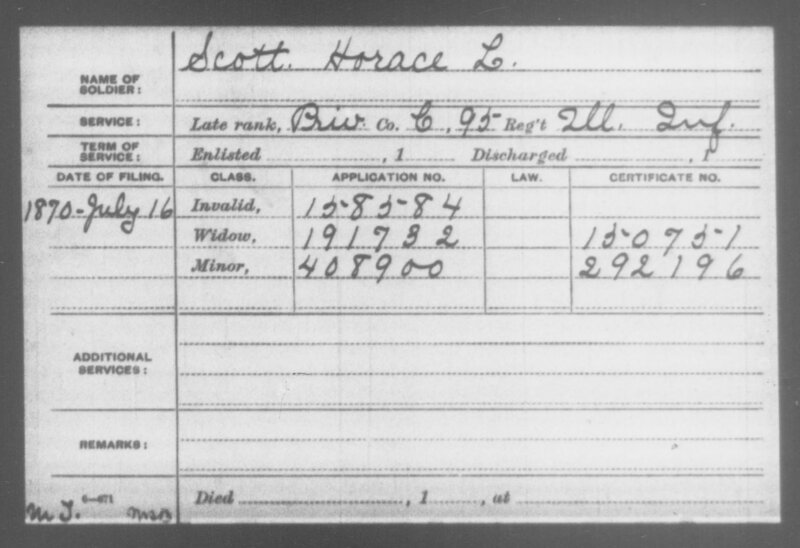 According to his entry in the Illinois Civil War Detail Report of the Illinois State Archives, Horace was mustered out by Capt. Hall at Camp Butler, Illinois, on August 17, 1865. After being honorably discharged from the army, Horace returned to Alden, IL. At some point between August, 1865, and 1867, he married Caroline Woodruff. He and his wife had two children together, Mary E. “Mate” Scott (born around 1867), and Frank Scott (born in 1869). On July 16, 1870, Horace Scott applied for an invalid class military pension. 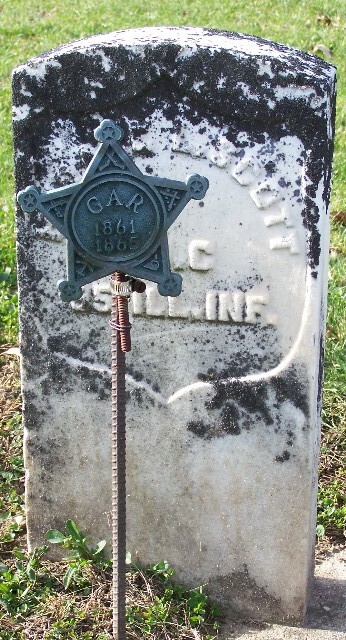 His index record confirms that he was a Private in Company C of the 95th Regiment of the Illinois Volunteer Infantry. What was the nature of his infirmity, I wonder? I’ll have to pay a visit to the National Archives regional branch office, as they don’t have pension files posted online. 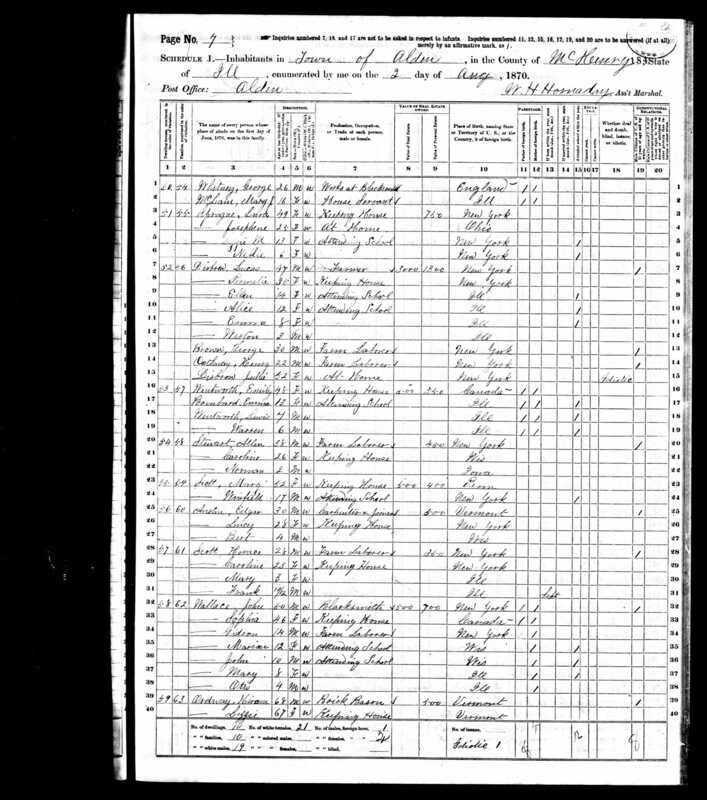 A month later, Horace, Caroline, Mary, and Frank were still living in Alden when the 1870 census was enumerated on August 2, 1870. Horace’s occupation is listed as “Farm laborer.” He apparently owned no land, but his personal estate was valued at $350. Theirs was not the poorest family in Alden, but theirs was certainly among the poorer households in the area. What happened to the presumably sizable bounty he would have been given for enlisting for such a long term of military service? Was he supporting his parents or siblings? Did he spend it while in the military? By 1875, Horace had died and been buried in Alden, and his widow Caroline and their children moved to Deer Creek, MN, to live with her parents. Was Horace wounded in the Civil War? Was that the cause of his status as an invalid after the war? Did it contribute to his premature death? There is so much left unanswered about Horace L. Scott, but with the tools available today, it may be possible to fill in many of these blanks and solve some of the mysteries surrounding his short life. Horace’s unit, the 95th Regiment of the Illinois Volunteer Infantry, was officially formed on the very day that Horace was mustered in (September 4, 1862), and it was disbanded on the very day that Horace mustered out (August 17, 1865). Thus, the experiences of his regiment can stand as a proxy for his own Civil War experiences. Ninety-fifth Infantry. — Cols., Lawrence S. Church, Thomas W. Humphrey, Leander Blanden; Lieut. -Cols., Thomas W. Humphrey, Leander Blanden, William Avery; Majs., Leander Blanden, William Avery, Charles B. Loop. 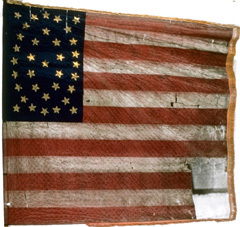 This regiment was organized at Camp Fuller, Rockford, and was mustered into the U. S. service Sept. 4, 1862. It was recruited from the counties of McHenry and Boone, three companies from the latter and seven from the former. It moved from camp on Nov. 4, proceeded via Cairo and Columbus to Jackson, Tenn., and afterward to Grand Junction, where it was assigned to Gen. McArthur’s division, Army of the Tennessee. It held an important position in its brigade during the charge of May 19 on the works at Vicksburg and lost in the engagement 7 killed and 54 wounded. During the assault of May 22 it gained an advanced position on the crest of the ridge near the enemy’s works and encountered one of the most sweeping and destructive fires to which troops were ever exposed. The total loss to the regiment in these two charges, was 25 killed, 124 wounded and 10 missing. It was engaged in the capture of Fort De Russy and in the battles of Old River, Cloutierville, Mansura, Yellow bayou and all the movements of the Red River expedition, fighting a portion of the time in the battle of Yellow bayou under one of the severest fires of artillery it ever experienced in a field fight. It was in the thickest of the fray at Guntown and fought with undaunted bravery. Finally both flanks of the regiment were turned by overpowering numbers of the enemy and it was obliged to fall back or suffer entire capture. In this engagement the 95th was nearly annihilated and on this account it was given a few weeks’ rest on its return to Memphis. It took part in the battle of Nashville and in the pursuit of Hood’s defeated army to the Tennessee river. During the summer of 1864 a detachment of the regiment, 100 men, participated in the battles of Kennesaw mountain, Chattahoochee river, Atlanta, Ezra Church, Jonesboro and Lovejoy’s Station. In later posts, I’ll look into some of these conflicts to see if I can find traces of Horace and hints of the experiences of his time in the American Civil War. Here’s one source I found to get me started: A history of the Ninety-fifth regiment, Illinois infantry volunteers: from its organization in the fall of 1862, until its final discharge from the United States service, in 1865. The first photo of Horace Scott? This entry was posted in 1860s, 1870s, Farmer, Frank Scott, Horace L. Scott, Mate Scott, Military by Michael. Bookmark the permalink.